Our job as leaders is to lead, which seems obvious. But more often than not leaders fail because there is no vision or plan to share and lead from. It’s hard to get people to follow unless they really understand the destination. It’s about believing. It’s about ownership. It’s about passion for even the smallest things. I often espouse, “If you can see it you can do it,” and that is really the core principle behind leadership: developing, articulating, sharing and executing a vision. This is accomplished when everyone on the team can “see” the entire vision or at least their part in it, and how their contribution fits into the greater whole. You know that your team is onboard when they can articulate back to you or to other members of the team. The first step is internal to the leader where they can see themselves implementing the vision /the outcome. The second is where the practice gets exponentially more powerful and difficult to achieve. It is the actual communication to others of the idea or product or task, so that everyone involved can also “see” it and understand what it requires. This second form of visualization can make or break a leader. When a leader can get everybody to see and share a single vision, it is galvanizing. A strong vision and understanding of the objectives will keep the efforts focused and driven to achievement. Almost anything can be accomplished if you can get everybody involved to see and understand the whole picture and their contribution to it. Leadership requires the ability to mobilize the best in the people on the team. It’s about getting everyone to work together towards the common goal or vision. Articulating the vision requires that the leader has” listened” to the vision from all angles. Tell us about your achievement? Who helped you do it? What are customers/clients etc. saying? These Talk Show questions force a leader to get out of their own perspective and look at the project, as it will be when it is complete. Answering these questions as a narrative forces details to emerge as the story is stitched together task by task, piece by piece. As you do this exercise, anticipate that the interviewer will probe the story you are telling and drive you to be more thorough. We often think we really understand our vision and what it takes to bring it to fruition, but that is so often not true. 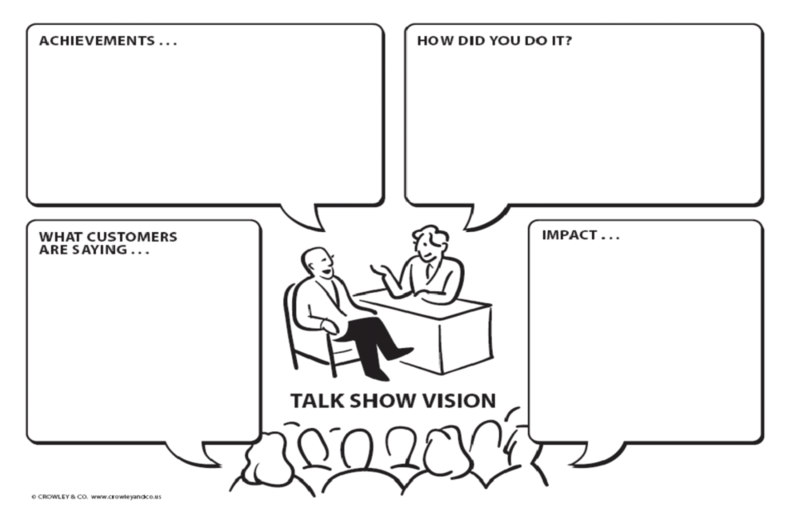 The Talk Show exercise allows you to bring others into the game to script the narrative, so you can not only can you tell the world (in your mind at least) about your vision, but prepare the foundation to work with your team more effectively. Who hasn’t had a daydream of telling someone important all about their work and their passion? Taking a step back to create these macro-views of your vision can help tell the story, and clarify the end goals. Why is telling your story or talking about your vision important? It is a way to express the mission, the company culture, and the reason for putting in the extra hours. It is also a way to attract the right talent to and move the agenda forward. It opens a leader to new solutions and breakthroughs. It provides the confidence to generate outstanding results. Never underestimate the importance of seeing your vision from all sides.